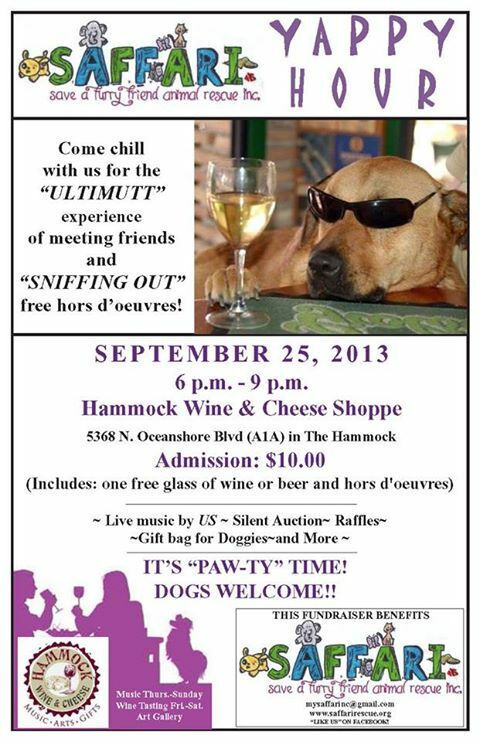 Come join us on September 25, 2013, from 6 p.m. – 9 p.m. at the Hammock Wine and Cheese Shoppe located at 5368 N. Oceanshore Boulevard (A1A) for Yappy Hour. Admission is $10 which includes a glass of wine or beer and hors d’oeuvres; and featuring live music, raffles and a doggie gift bag. This is a fundraiser event to benefit the Saffari Animal Rescue.